Quinoa is one of the world’s superfoods because it is highly nutritious. Although referred to as a grain it is actually a seed prepared as a grain and is naturally Gluten-Free and non-GMO. Quinoa has a nutty flavour and a slight crunch. 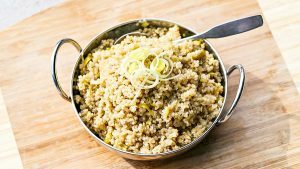 Quinoa can be used as a replacement for rice, barley or couscous in your savoury dishes or can be used as a hot cereal or in muffins instead of oats; the list of healthy recipes is endless. There are three main types of quinoa, white red and black. 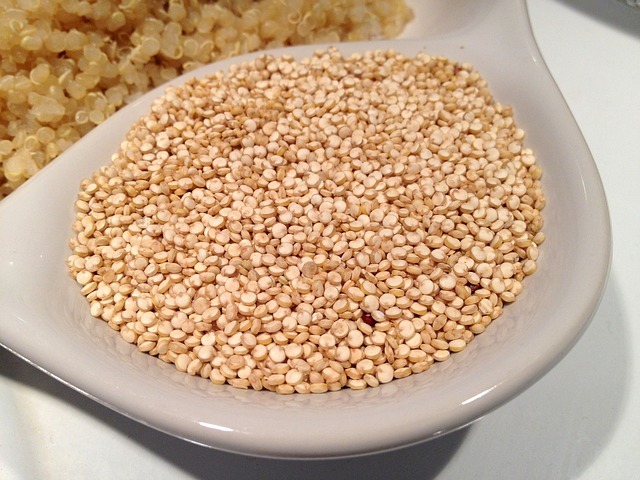 It is important to rinse quinoa because it is coated with toxic checal called saponin. Quinoa can be found in most health food stores or supermarkets and in many cases it is already pre-washed. Quinoa is very high in complete protein with all the essential amino acids we need. It has 8 grams of complete protein per cup, making it an excellent choice when substituting for wheat and other grains. It also increases metabolism and reduces appetite making it a favourite for someone that is watching his or her weight. Quinoa is high in fiber 17 – 27 grams per cup, which is very high, higher, then most grains. Quinoa has a low glycemic index, this controls your blood sugar levels making it a good choice for diabetics or for controlling your hunger. The GI is approximately 53, which is considered low. Quinoa is high in minerals especially in magnesium potassium zinc and iron, which in todays diet many of us don’t get enough of. Quinoa is loaded with antioxidants. Antioxidants are substances that are believed to help fight ageing and many diseases in a way that they neutralize free radicals. Add 1 cup of quinoa to 2 cups of water with a pinch of sea salt. Bring to boil and cook for 15 minutes.